College basketball practice begins today and preseason magazines are hitting newsstands across the country. We rounded up six different preseason prognostications to gauge the temperature of the Big Ten. Michigan is projected in either second or third place in the league by all six sources that we compiled. Michigan State is projected as a unanimous conference favorite but there are mixed opinions regarding the middle of the league. Purdue (2nd through 9th) and Minnesota (4th through 13th) are the two teams with the largest range of projected outcomes. Here’s a look at our aggregate table combining data from Blue Ribbon, Lindy’s, Athlon, Street & Smith’s, Three Man Weave and Bart Torvik’s T-Rank. Three conference players made the All-Big Ten First Team in all five outlets that published a first team list: Carsen Edwards, Ethan Happ and Cassius Winston. Romeo Langford (2), James Palmer Jr. (2), Nick Ward (2), Juwan Morgan (2), Jordan Murphy (1) and Charles Matthews (1) also received at least one first team mention. Despite the fact that James Palmer Jr. is one of only two returning All-Big Ten First Team players in the league, he received only two first team mentions (Three Man Weave and Athlon) and Lindy’s didn’t put him on any of its top three teams. Here’s a rundown of other takeaways from each preseason publication. Blue Ribbon has Michigan ranked 23rd in its preseason top 25. Other ranked teams on the schedule include Michigan State (10), North Carolina (12), Purdue (19) and Villanova (21). The magazine ranked Michigan’s backcourt third in the league behind Michigan State and Purdue. It gave the the nod to Wisconsin for the best frontcourt with Michigan State and Indiana at No. 2 and 3. Blue Ribbon’s Preseason All-Big Ten team features Carsen Edwards (POTY), Ethan Happ, Romeo Langford, Jordan Murphy and Cassius Winston. Blue Ribbon was the only publication to place Jordan Murphy on the All-League team. Carsen Edwards and Ethan Happ are both named First Team All-Americans by Blue Ribbon. Lindy’s has Michigan ranked 21st in its preseason top 25. North Carolina (6), Michigan State (10), Villanova (15), Purdue (17) and Indiana (25) are other ranked teams on the docket. Lindy’s All-Big Ten team had two more unique names in Nick Ward and Romeo Langford along with consensus picks Carsen Edwards, Cassius Winston and Ethan Happ. Charles Matthews is ranked 105th in Lindy’s top-150 players list, the only Michigan player on the list. League players ranked ahead of Matthews include Carsen Edwards (2), Cassius Winston (9), Ethan Happ (15), Romeo Langford (25), Nick Ward (33), Anthony Cowan (34), Tyler Cook (41), Jalen Smith (51), Lamar Stevens (56), Josh Langford (59) and Ayo Dosunmu (71). Carsen Edwards is a first team All-American while Cassius Winston (2nd) and Ethan Happ (3rd) also earn All-American mention. Michigan checks in at No. 24 in Athlon’s Preseason Top 25. Michigan State (10) and Nebraska (25) are the only other ranked teams in the Big Ten. Athlon thinks that four Big Ten coaches are on the hot seat this year: Pat Chambers (Penn St.), Tim Miles (Nebraska), Richard Pitino (Minnesota) and Fran McCaffery (Iowa). Athlon’s All-Big Ten team features Carsen Edwards, James Palmer Jr., Ethan Happ, Cassius Winston and Juwan Morgan — a perfect match with our Preseason Top 25 list. Athlon has Charles Matthews checking in at No. 36 in its Preseason Top 100 Players list. Villanova (13) and North Carolina (7) are Michigan’s only non-conference opponents in the preseason top 25. Michigan is ranked 17th in Street & Smith’s top 25, higher than any other publication. Michigan State (12) is the only other Big Ten team in the top 25 with North Carolina (7) and Villanova (9) on the non-conference slate. The Street and Smith’s All-Big Ten team is Cassius Winston, Charles Matthews, Carsen Edwards, Nick Ward and Ethan Happ. Edwards is a first team preseason All-American, Happ is second team and Ward and Matthews are third team. Other first team All-Americans include: R.J. Barrett (Duke), Grant Williams (Tennessee), Luke Maye (North Carolina) and Dedric Lawson (Kansas). Street and Smith’s is the only publication not to rank Rutgers last in the league, that honor goes to Illinois. The Big Ten is a league for established college stars with Carsen Edwards (1), Charles Matthews (4) and Ethan Happ (5) all making that top 5 list in the magazine. Street and Smith’s has Tim Miles and Richard Pitino as two of their five coaches on the hot seat. The Three Man Weave All-Big Ten team features Cassius Winston, Carsen Edwards, James Palmer Jr., Juwan Morgan and Ethan Happ. The crew over at Three Man Weave is buying the hype on Indiana, projecting them at third in the conference — highest of any publication. Charles Matthews checks in at No. 23 on the Three Man Weave Top 100 players list. The top two players on the list are both from the Big Ten: Carsen Edwards at No. 1 and Ethan Happ at No. 2. I’m not sure who the preseason favorite should be (I honestly don’t think it is Michigan or Michigan State), but the fact that everyone picked Michigan State just feels lazy to me. Oh, they won the league last year how about we pencil them in. Why so much love for Purdue? Didn’t they lose 4 starters? If they are high on Purdue because of one player, wouldn’t they be equally high, or higher, on Wisconsin because of one great player with more returning support? Just don’t see Purdue that high (second) based on Edwards alone. I’m not saying Purdue should be that high necessarily, but a player of Carsen Edwards’ caliber plus their record last year is the thought process I assume. 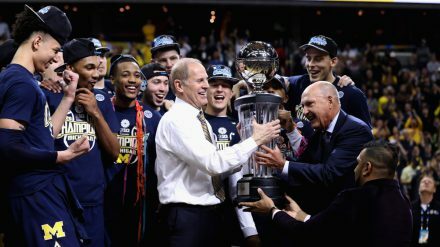 John Beilein is brilliant. He’ll need to pull out all his tricks when his team is losing their three best offensive weapons.